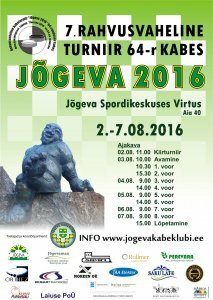 International competition in draughts-64 “Jogeva-2016” is held from 02 August to 07 August 2016 in Jogeva, Estonia. International grandmaster Vladimir Skrabov (Russia) became the winner of the Rapid program. International grandmaster Guntis Valneris (Latvia) won Classic program. 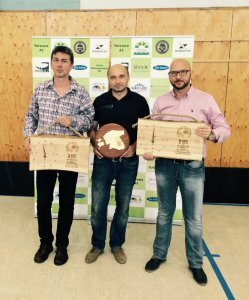 07-08-2016 International competition in draughts-64 in Jõgeva ended with the victory of International Grand Master from Latvia Guntis Valneris. Vladimir Skrabov scored with him the same number of points and shared 1-2 places, but the additional criteria was better for representative of Latvia. Third place took the Grand Master from Moscow Andrey Kalachnikov. International Master Sofia Morozova, without losing a single match, took 5th place in overall standing and become the best among women. 06-08-2016 Before the last round 11 points have Vladimir Skrabov and Guntis Valneris. The fate of the first place will be decided tomorrow in pairs Raivo Rist – Vladimir Skrabov and Oleg Polikarpov – Guntis Valneris. In women, the fight for first place is still between Sofia Morozova and Antra Valnere. They have 8 points and diffikult games in the final round. 05-08-2016 After 6 rounds with a score of 10 points of 12 leading International Grandmaster Vladimir Skrabov. 9 points and second place of standings have International Grandmaster, former world champion in draughts-100 Guntis Valneris. National Grandmaster Andrey Kalachnikov and national Master of sports Oleg Polikarpov pursue they with the score of 8 points. In women fight for 1st place being between Sofia Morozova and Antra Valnere. 03-08-2016 Classic program started. See current results. 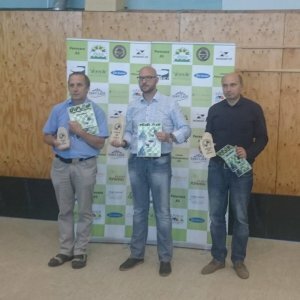 02-08-2016 International competition in draughts-64 “Jogeva-2016” started. 18 players from Latvia, Lithuania, Estonia and Russia take part in competition. Among them are international grandmasters, prize-winners of World and European Championships among men Vladimir Skrabov (Russia), Guntis Valneris (Latvia), Arno Uutma (Estonia), as well as the strongest female grandmasters from Russia Sofia Morozova and Tatiana Teterina. The best result among women have Antra Valnere (Latvia). Competition is held for promotion and development of draughts-64, excellence and fulfillment of international titles IDF, strengthening the friendly relations between draughts players of the countries – member of IDF. 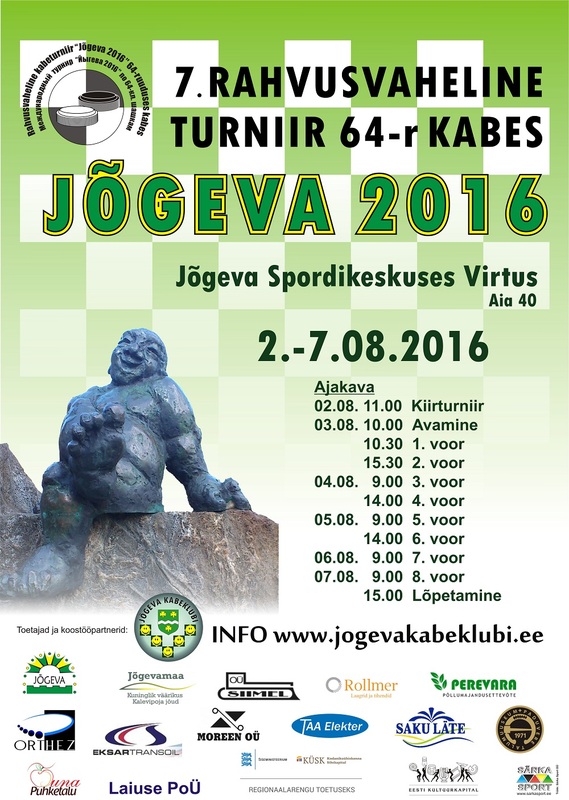 Tournament is held from 02 August to 07 August 2016 in Jogeva, Estonia. Venue: Jõgeva Sport Center “Vitrus” (Aya str. 40, Jogeva, Estonia. 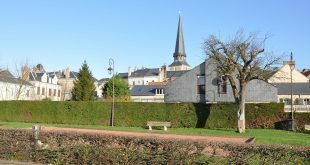 Rapid is held 02 August, opening at 11.00. 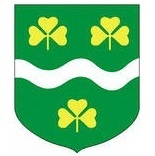 Main tournament is held from 03 to 07 August. Opening 03 August at 10.00, closing 07 August at 15.00. Players who declared until 10 July are allowed participate. Applications must be send until July 10, 2016 to email: [email protected], [email protected], tel. +372 5058239 (Ülar Poom), or by post: Pargi str. 18-2, 48303 Yogeva, Republic of Estonia, Uno Plakk. 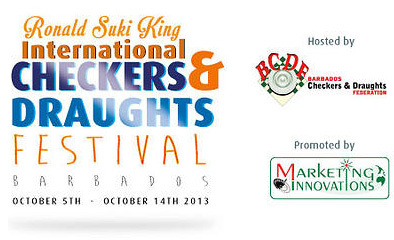 It is held two overall tournaments in draughts-64 for men and women: Rapid and main tournament. Competitions are held on the system of micro-matches from two games. The time control is 10’ to the end of the game + 2” per move for each participant in both parties of micro-match. Competitions are held on the system of micro-matches from two games. The time control is 45’ to the end of the game + 30” per move for each participant in both parties of micro-match. Places determined in overall standing, among women, players with rating below 2350 (EDF) or 2100 (IDF) and veterans (60+). The prize fund in Rapid is 250 EUR, the prize fund of main tournament is 1200 EUR.